Until fairly recently, Nepal was the world's last constitutionally declared Hindu nation-state. This changed in early 2006, after a democracy movement brought about the expulsion of King Gyanendra, after which the Nepali Parliament amended the constitution to make Nepal a secular state. 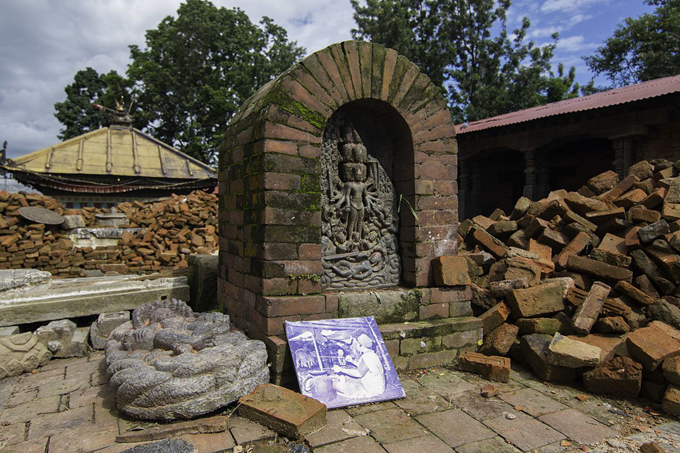 If one were to judge simply on the basis of visual identification of temples, Nepal might seem to be predominantly Buddhist, but that is not the case. According to their 2001 census, 83% of Nepalese are Hindu, 10.7% are Buddhist, 4.4% are Muslim, and 3.6% are Kirat. The Hindu population in Nepal is slowly declining today, with a corresponding rise in the Kirat population. Given the history of population in the region by the meleccha/yavana ancestors of the Kirat, and Sri Krishna's efforts to establish and re-establish the Yadhavas, it should be no surprise that in this age of Kali, Vedic influence is on the wane. The largest concentrations of Buddhists in Nepal are in the eastern hills, the Kathmandu Valley, and the central Tarai (the Mahabharata Range plain). Among the 10% Buddhist demographic, Buddhism is more common among the Newar and Tibeto-Nepalese groups. But among the Tibeto-Nepalese, those most influenced by Hinduism are the Magar, Sunwar, and Rai peoples. Hindu influence is less prominent among the Gurung, Limbu, Bhote, and Thakali groups, who continue to employ Buddhist monks for their religious ceremonies. Since both Hinduism and Buddhism are rooted in dharmic religion, they generally accept one another's practices, and many people practice a combination of both. Like the increasing consolidation of the Hindu and Buddhist faiths, there is a continuous merging of traditions between the Hindu and Kirat faith populations, with the former group adapting some of the animalistic practices of the latter. Most Nepalis celebrate Dashain (Vijay Dashami) and Buddha Jayanti regardless of their professed religion. Nepal was declared a 'Hindu Kingdom' by King Prithvi Narayan Shah (1723–1775 A.D.) During the Shah reign, Nepal's kings performed their duties as representatives of both Buddhist and Hindu deities. In terms of performance of religious ceremonies, Buddhism in Nepal is distinctly different from Buddhism in Japan. Likewise, Nepali Hindus are different from Indian Hindus, due in part to the merging of Buddhist/Hindu practices. Nonetheless, as our series on Nepal in the Mahabharata Period continues, we will find a great many temples and shrines that are predominantly Vedic. The fact that Nepal is closely associated with Mahabharata events is reflected in many place names in the region. There is a town in Nepal named Mahabharata. The city of Janakpur is named after Raja Janaka, the father of Sita Devi, and the Kapilvastu District is named after the great Sage Kapila. The Kalapaani pass near the Lipu-Lekh border between India and Tibet is known as the Vyasa Valley, and Kailash Lake is found at Mansarovar. Turning back to the early history of Nepal, the reader will recall our opening segments in this series, which narrated Sri Krsna's battle with Banasura. 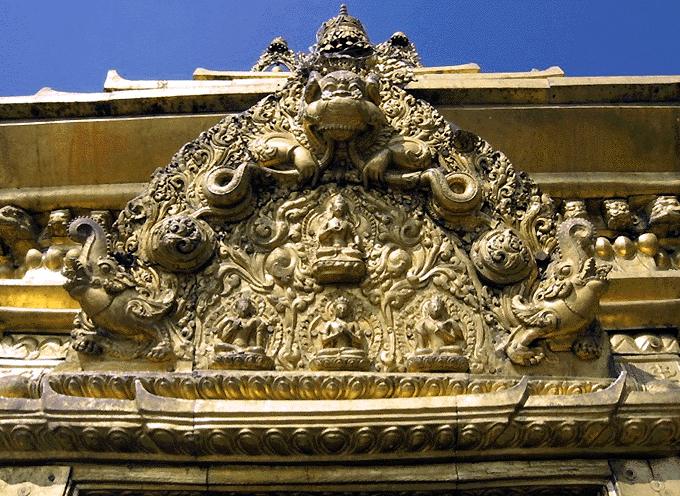 After defeating Bana, the Lord re-installed the Yadava dynasty's rule in Central Nepal. The Yadava's reign ended when King Bhuvansingh was defeated by Yalamba. We also discussed the Kirat king, Bhagadatta, who died at the end of Arjuna's arrow. His son Jitedasti also served as a king of the Kirats, and he was also killed at the battle of Kurukshetra, fighting against the Kauravas. When he died, Bhima took over Jitedasti's fighting force. From the end of the Mahabharata Period, up to the end of the line of 29 Kirat kings of Nepal, there were several kings who ruled during the time of Buddha, then Emperor Ashoka. Gautama Buddha visited Central Nepal during the reign of Jitedashi. He preached in Nepal valley and visited the shrines of Swayambhu and Guheswari, making 1,350 disciples. King Ashoka, the third monarch of the Indian Mauryan dynasty, visited Nepal sometime between 269-265 B.C., when Kirat King Stungko was ruling Central Nepal. 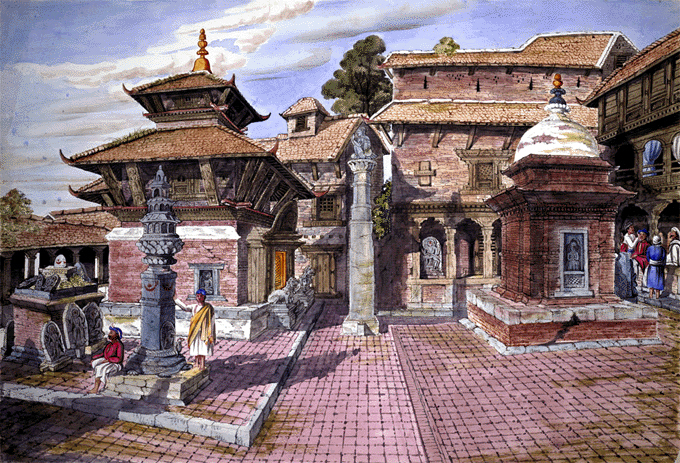 Ashoka constructed a Buddha stupa in Patan and a shrine in Lumbini. To mark the birthplace of Gautama Buddha, he had inscriptions engraved on rocks and set up a stone pillar there. Around 640 A.D., Chinese traveler Hieun Tseng visited this place. He described that the stone pillar had been cracked due to thunder. During Asoka's visit to Kathmandu, he gave his daughter Charumati in marriage to Devapal, a kshatriya prince. 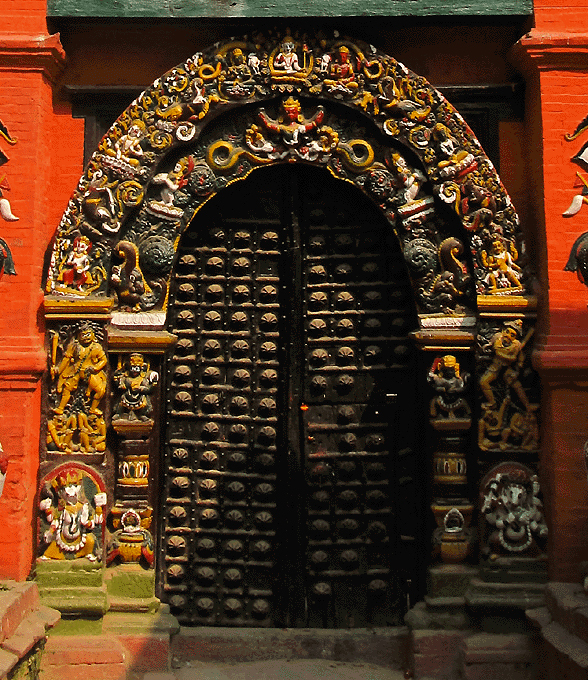 She settled near Pashupati and later founded the town of Devpatan in memory of her husband. 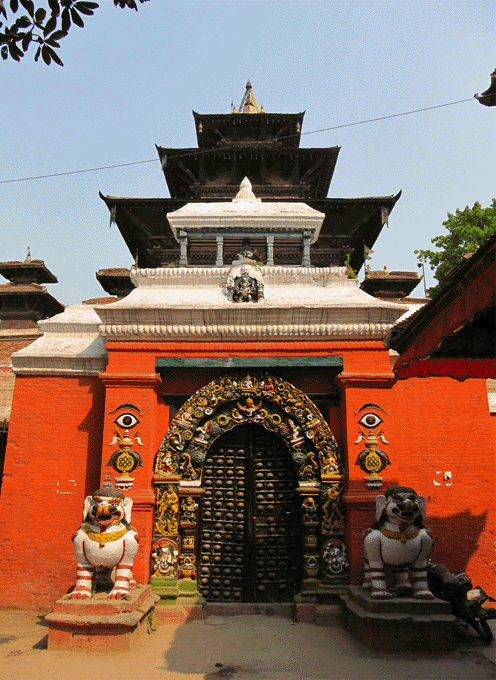 The Taleju Temple in Kathmandu Darbar (pictured top of page) was not damaged during the April 2015 earthquake and immediate aftershocks, but it was damaged during the May 12th aftershock. The Taleju temple, which sits upon 12 plinths, sustained various cracks. 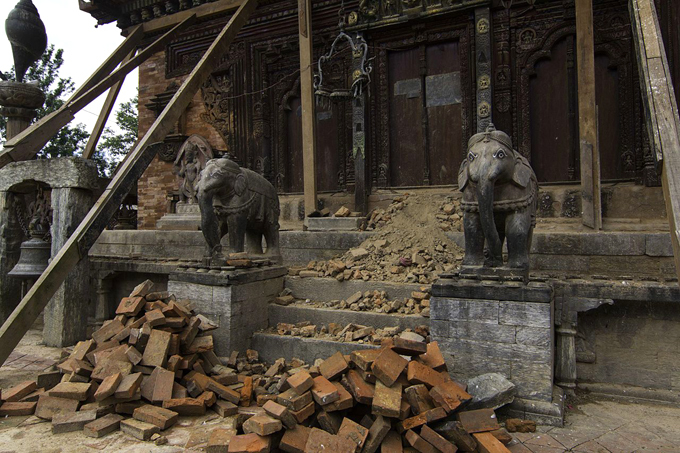 Its pinnacle collapsed, and the main temple was slightly moved, becoming slanted. The structure has been secured and repaired. 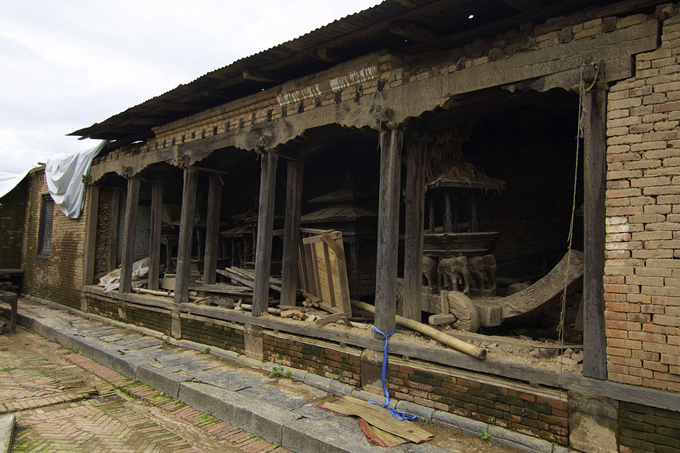 The Changu Narayan Temple in Bhaktapur, pictured immediately above, was badly damaged by the great quake. While parts of the façade remained relatively intact, some walls and interior sections collapsed, as depicted in the three photos below.